Quasars are some of the most luminous objects in the Universe. 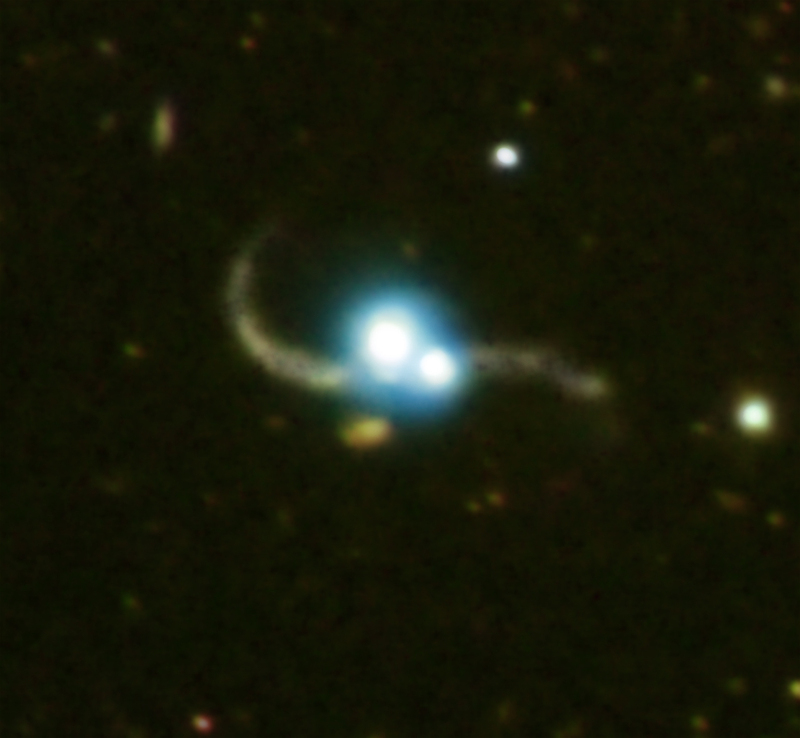 The system SDSS 1254+0846 has a pair of them -- the first time this has been seen. This double quasar is likely the result of a merger of two galaxies. 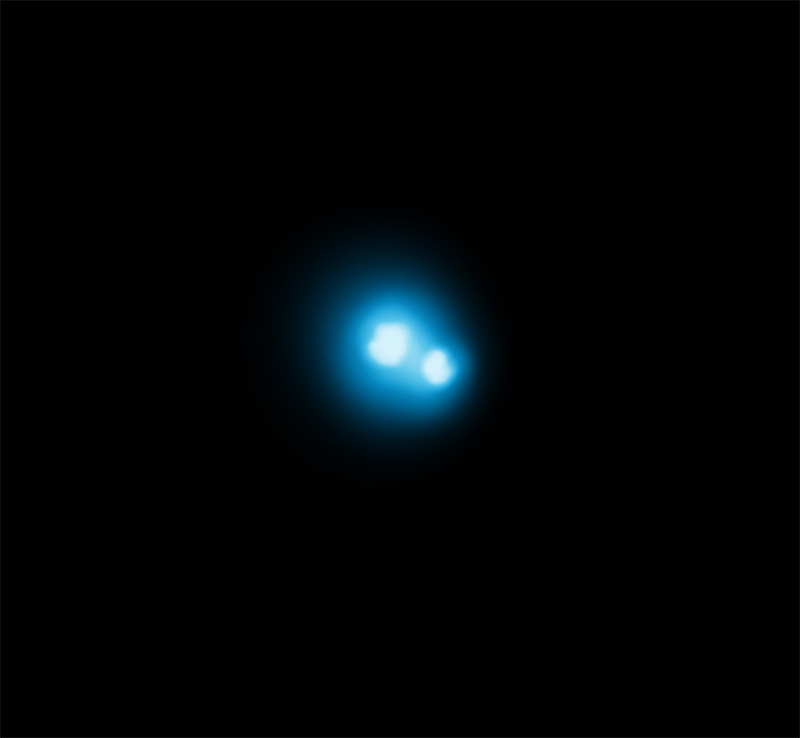 This pair of quasars was first detected by the Sloan Digital Sky Survey, a large-scale astronomical survey of galaxies and quasars. They were observed with the Magellan telescope to determine whether the quasars were close enough to show clear signs of interactions between their host galaxies. "The tidal tails fanning out from the galaxies that we see in the optical image are a sure sign, the litmus test of an ongoing galaxy merger," said Green. This result represents strong evidence for the prediction that a pair of quasars would be triggered during a merger. The galaxy disks both appear to be nearly face-on to Earth, which may explain why the X-rays from Chandra show no signs of absorption by intervening gas or dust. Coordinates (J2000) RA 12h 54m 54.90s | Dec +08° 46´ 52.30"
Thanks for your comment. I see some discussion of "plasmoids" in peer-reviewed papers, mostly to do with solar system phenomena, though without further research I don't know if any of these correspond to "Bostick's" plasmoids and the related theories of an "electric Universe". However, any arguments that these plasmoids discount the need for black holes (or important elements of modern cosmology, including the existence of dark matter and dark energy) are well outside mainstream thinking. There are many independent lines of evidence for the existence of black holes, dark matter and dark energy. That doesn't prove that these "electric Universe" theories are wrong, it just means they're very unlikely to be right. The observed phenomena looks exactly like Bostick's plasmoids and is an excellent support for electric universe theory. No mystical, unobservable, unmeasurable, unfalsifiable, dark occult properties are required to explain any of it. The images are really awesome. Thank you. The explanations offered are weak. It is unfortunate that more credence is not given to other theories. When only one theory is allowed to be considered, it isn't science anymore. It is religion. and studying the orbits of stars near the center of our galaxy, which point to an object weighing about 4 million times the mass of the Sun. The prodigious amounts of light produced by quasars are also best explained by black holes. These don't constitute proof that black holes exist, but taken together they represent powerful evidence. Thanks for your comment: the evidence that Markarian 205 is directly connected to a neighboring galaxy at a very different redshift is too weak to be taken seriously. It is perfectly reasonable for two objects at different distances - but closely separated on the sky - to show regions of overlapping light. There is an overwhelming amount of evidence that redshifts accurately give distances in the cosmos. Thanks for your comment which we'll take into account. I wish there were audio to go along with your articles similar to what Dr. Tony Phillips does on Science Nasa Gov. Many years ago Emil Wolf showed that radio signatures that associate with quasars are produced when light passes through turbulent radio atmospheres as must happen when galaxies colide. We have known for more than a decade that Markarian 205 has a filament directly connecting the galaxy less than 200,000 light years away to a quasar that was once believed to be millions of light years beyond Markarian 205. How can you tell the difference? Why do Astronomers state as fact that black holes exist? It is still only a theory but it seems the assumption is gospel X-Rays are a electromagnetic phenomenon i e an electric current a magnetic field. Very good, and it is a relevant area as our galaxy heads toward Andromeda, so we can look to see interactive relations in collision and black hole action. will be hard to detect around other stars. Thanks very much for the heads-up! Thanks for posting this. It discussed very well, also it is very much informative. However, I want to know whether these two quasars are living in only one galaxy or both the two galaxies. Meraviglioso (marvellous). As Oscar Wilde said. "We are all in the gutter, but some of us are looking at the stars." Thank you for the beautiful works. Maybe the physics of the forming object also produces secondaries, which produces its own secondaries etc as size and energy permits. I have a question. Are there bubbles aside of other stars? I understand that there is one near the solar system. Is it common? I don�t mean the heliospheric-gas interaction oblateness, just a bubble. At what size relative to the solar system? What motions? What shape? Paticles may be inside it emitting a frequency that can be read. Is there inter-action with the solar system? How inspiring and interesting to see if any similar objects can be found nearer to milky way and what if any affect it may have on us. Think of it, the light were seeing left. About the same time as the birth of our planet. Sometimes, looking at these images, I feel I'm looking into eternity. Amazing, but did you check the SDSS J1254+0846 in Wikisky? The quasars are already there. Also, I can see a strong UV emission from Wikisky GALEX survey. Thanks a lot for regular & today's information with related links, help us to boost our knowledge. I want to see an actual dead on center collision between two quasars in order to see what the result is. There is always something new to learn and discover. Our universe is always full of surprises just waiting for us to discover them. For a number of years we have been hiking and playing in the immediate vicinity of the Effelsberg Germany radio-telescope. Your magic website with its intoxicating contents allow us now to visualize some of the space objects to which radio signals from Effelsberg are being sent to. We wish you good luck and continued success in capturing these magic visions. This has to be spectacular. With the Telescopes and backup now available, one wonders what is the next discovery. So impressive and a wonderful discovery. Two galaxies caught in the act of merging. About 4.6 billion light years from Earth. X-rays from Chandra were overlaid on an optical image from the Baade-Magellan telescope in Chile. About 1.34 million light years across. In the Zodiac constellation Virgo (the maiden), visible in both Hemispheres.